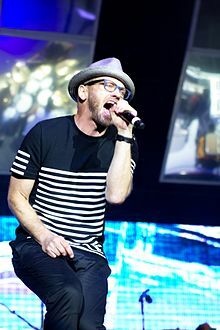 Toby McKeehan (born Kevin Michael McKeehan; October 22, 1964), better known by his stage name TobyMac (styled tobyMac or TOBYMAC), is a Christian hip hop recording artist, music producer, songwriter and author. He has charted 20 solo singles on Billboard's Christian Songs list. He was first known for being a member of the Christian vocal trio DC Talk, staying with them from 1987 until they went on hiatus in 2000. He has since continued a successful solo career with the release of seven studio albums: Momentum (2001), Welcome to Diverse City (2004), Portable Sounds (2007), Tonight (2010), Eye on It (2012), This Is Not a Test (2015), and The Elements (2018), as well as four remixed albums: Re:Mix Momentum (2003), Renovating Diverse City (2005), Dubbed and Freq'd: A Remix Project (2012), and Eye'm All Mixed Up. He also has a full-length Christmas album Christmas in Diverse City (2011), which was his first holiday album. He became the third Christian artist to have a No. 1 debut on Billboard 200 chart with Eye on It. Between DC Talk and his own solo career, he has sold more than 10 million albums and won seven Grammy Awards. He has had six No. 1 hit CHR singles including "Gone", "Made to Love", and "Lose My Soul." Six singles have gone to No. 1 on Billboard's Christian Songs chart, making him one of the artists with the most No. 1 hits on that chart. His live concert CD+DVD combo album, Alive and Transported, was released in 2008 and received the Grammy Award for Best Rock or Rap Gospel Album at the 51st Grammy Awards in 2009. His fifth studio album, Eye on It, received a Grammy for Best Contemporary Christian Music Album at the 2013 Grammys. TobyMac formed DC Talk with Michael Tait in 1987 at Liberty University. He and Tait released Christian Rhymes to a Rhythm in 1988 and recruited classmate Kevin Max Smith to join the group. The three set out on tour after they released their first album in 1989, DC Talk. In 1990, they released Nu Thang, their first gold album. After the Nu Thang tour, they recorded Free at Last which was certified platinum. DC Talk gained mainstream attention by playing on The Tonight Show with Jay Leno and The Arsenio Hall Show. They released their next album, Jesus Freak, in 1995, and it went multi-platinum and led to the Jesus Freak World Tour. They released the tour CD, Welcome to the Freakshow. Following the release of "Between You and Me" which reached No. 29 on the Hot 100 in 1996, the group released Supernatural, which would be their last album. The album was certified platinum. DC Talk disbanded in 2001 and its members embarked on solo careers. In 2005, the band performed together at a show in Redmond, Washington, and again in 2010 when he made a surprise guest appearance at Winter Jam in Nashville. In 2011, he joined Tait on the song "Jesus Freak" in Greensboro, North Carolina. DC Talk has recorded several songs together since their hiatus, including 2002's "Let's Roll", a song about the terrorist attacks on September 11, 2001, "Atmosphere (Remix)" on his 2004 album Welcome to Diverse City, "The Cross", a track on Kevin Max's 2007 album The Blood, and "Love Feels Like", a track on his 2015 album This Is Not a Test. In 2001, he released his first solo album titled Momentum. He composed and recorded the song "Extreme Days" for the 2001 Truth Builder Productions film Extreme Days, which was featured on the Momentum album. Momentum, debuted at No. 1 on the Billboard Heatseekers chart in the November 24 issue. The song "Extreme Days" was also used in the movie Hangman's Curse, based on a book by Frank Peretti. His song "Get This Party Started" was featured on an episode of the TV show Roswell. His song "Yours" reached the Top 5 on ChristianRock.net. "Yours", "Extreme Days", "Get This Party Started" and "Momentum" were all featured in the Xbox 360 video game Crackdown. "Momentum" earned five Dove Awards and a Grammy nomination. He was nominated for Artist of the Year at the 34th GMA Dove Awards. In 2002, Toby performed at the Festival Con Dios. Later that year, he released his first Christmas single, "This Christmas". In 2003, he released Re:Mix Momentum, a remix of the album Momentum. His song "Yours" was used in Total Nonstop Action Wrestling (TNA) as "Sting's" theme song. He was featured on "Throw Yo Hands Up" on Kirk Franklin's 2002 album The Rebirth of Kirk Franklin. McKeehan's next album, titled Portable Sounds, was released in 2007 and sold 50,645 copies in its first week, debuting at No. 10 on the Billboard 200, and at No. 1 on the SoundScan Contemporary Christian Overall chart. The album also received a Grammy nomination for Best Pop/Contemporary Gospel Album. He won rock/contemporary album of the year for "Portable Sounds" at the 39th annual GMA Dove Awards. The songs "Made to Love" and "I'm For You" both hit No. 1 and were the second and third most played songs on Christian Hit Radio stations in 2007. "Hype Man (truDog '07)" features his son Truett. "Ignition" is being used by ABC/ESPN to promote its coverage of NASCAR, and "Boomin'" has also been used to promote a new crime-drama, The Women's Murder Club, on ABC, as well as others. In September 2007, his song "Feelin' So Fly" appeared in the film The Game Plan, starring Dwayne "The Rock" Johnson. "Ignition" received worldwide exposure when it was used as the Arizona Cardinals entrance music during the pre-game of Super Bowl XLIII. He was awarded two Dove Awards for his work on this album, including Artist of the Year. His music video featuring the song "Boomin" was awarded a Dove Award for Short Form Music Video of the Year. Around this time also, he wrote his song, "New World" for "The Chronicles of Narnia: The Lion, the Witch and the Wardrobe" and recorded the song "What We Gonna Do?" for the VeggieTales movie, The Pirates Who Don't Do Anything: A VeggieTales Movie. "Feelin' So Fly" and "I'm for You" appear in Thrillville: Off the Rails. He released his first live album as a solo artist in 2008. Alive and Transported was a live recording of the Portable Sounds Tour in Houston, TX. It included covers of popular DC Talk songs "Jesus Freak" and "In the Light". The album included a DVD of the concert and gained him a GMA Dove and a Grammy Award. His fourth studio release, Tonight, was released on February 9, 2010. The album debuted at No. 6 on the Billboard 200, selling 79,000 units in its first week. The album's first single, "City on Our Knees", was released on August 14, 2009. The song reached No. 1 on Billboard's Hot Christian Songs and No. 1 on both Christian AC and CHR. Christopher Stevens and Dave Wyatt joined McKeehan in producing the album, as with the production of his 2007 release, Portable Sounds. Truett, aka TruDog, Toby's oldest son, was once again featured on a song as in the previous albums. The album is a mix of pop, rock, hip hop, Latin, and funk, similar to his album Portable Sounds. The album charted No. 6 on the Billboard Top 200 and No. 1 on the Billboard Christian albums chart; selling 79,000 units in its first week. In the same year, Toby released a DVD, TobyMac: Moving Pictures Featuring His Entire Work of Music Videos, on November 10, 2010. The title track of Tonight is featured in the intro of MLB Network's TV show 30 Clubs 30 Days. In March, he announced the "Hello Tonight" summer 2010 tour with Chris Tomlin. The song "City on Our Knees" earned him a Dove Award for Pop/Contemporary Song of the Year. The song "Showstopper" was used to promote World Wrestling Entertainment's (WWE) June 2010 Pay Per View, "Fatal 4-Way", and was used at least once in NCAA Basketball. It was also used as an introduction to Thursday Night Football in 2009–2010. His single "Tonight" was also used as a pregame introduction at home games for the Baltimore Orioles during the 2011 MLB season. The song was also promoted for ESPYS' Best U.S Male Olympian. His "Tonight" was listed best Christian album of 2010 on iTunes and his Christmas single titled "Christmas This Year" (featuring Leigh Nash) was awarded the holiday song of the week on iTunes. He was nominated for "Artist of the Year" at the 2011 Dove Awards. Additionally, the songs "Get Back Up" and "City on Our Knees" were recognized for being two of the Top 25 most performed songs on Christian radio over 2010. In 2010, Toby performed at Revelation Generation. He also toured with Skillet and House of Heroes on the "Awake Tonight Tour". Toby toured with Third Day, Michael W. Smith, Jason Gray and Max Lucado on the World Vision-sponsored "Make a Difference Tour 2010". Tonight was nominated for a Grammy in the category "Best Pop/Contemporary Gospel Album" for the 53rd Annual Grammy awards. His first full-length Christmas album, Christmas in Diverse City, was released October 4, 2011. It contains songs from each of the Diverse City members as well as TobyMac. Its other guest artists include: Leigh Nash, Owl City, Jamie Grace, Victor Oquendo, Superherose, Arch Nemesiz, Tim Rosenau, Todiefunk, and Byron "Talkbox" Chambers. TobyMac released his third remix album, Dubbed and Freq'd: A Remix Project, on March 27, 2012 featuring remixes of songs from his prior two studio albums. His fifth full-length studio album, Eye on It, was released August 28, 2012. The album debuted on the Billboard 200 at No. 1, which is a first for a Christian album since 1997, and sold 69,000 copies in its first week. The album fell to No. 8 on the second week with 26,000 sales. The first single, "Me Without You", was released to iTunes and Amazon MP3 on June 12, 2012 and went to No. 1 on Billboard's Christian Songs chart on September 1, 2012, becoming the singer's fifth chart-topper. "Family" was used in a promotional advertisement campaign for the show Blue Bloods. One showing of this advertisement was during the 2013 Super Bowl. "Forgiveness" is a collaboration with Christian rapper Lecrae. Although not released as a single, "Eye on It" was utilized by the ACC Network on its telecast of the 2013 ACC Men's Basketball Tournament. [better source needed] The song was also used in several commercials by the Fox Sports Networks for NBA and MLB telecasts. He appears in the 2013 film I'm in Love with a Church Girl. A remix album, titled Eye'm All Mixed Up, which features remixes from the album Eye on It, was released on November 4, 2014. During his "Worship, Stories, and Songs Tour" in 2014, he performed the first single from his new album, titled "Beyond Me", which was released on January 6, 2015. The single "Beyond Me" also appeared on Hot Shot Debut at No. 34 solely on the strength of radio airplay. His sixth studio album, This Is Not a Test, (stylized as "***This Is Not a Test***") was released on August 7, 2015 and debuted at No. 4 on the Billboard 200. The album appeared on Top Christian Albums at No. 1, selling 35,000 copies in its first week. "Backseat Driver" was released as a promotional single from the album on June 9, 2015, which was later followed by "Til The Day I Die" on July 10, 2015, and "Feel It" on July 24, 2015. On November 3, 2017, he released Light of Christmas. In January 2018, he released "I Just Need U", which debuted at No. 1 on the Hot Christian Songs chart, making the song TobyMac's sixth No. 1 single to top the chart. In July 2018, he released "Everything" as a single. In September 2018, he both announced his new album, The Elements, and released "Scars" as a single. The album was released on October 12, 2018 and became his fifth album to top the Christian Albums chart on Billboard. He has written two books with Michael Tait and Kevin Max, Jesus Freaks: DC Talk and The Voice of the Martyrs – Stories of Those Who Stood for Jesus, the Ultimate Jesus Freaks, and Jesus Freaks: Revolutionaries: Stories of Revolutionaries Who Changed Their World: Fearing GOD, Not Man. These books are mainly focused on Christian martyrs. Toby Mac has also written two more books with Michael Tait, one titled, Under God, containing stories of America's spiritual battles, and another book called Living Under God: Discovering Your Part in God's Plan. He has written a fifth book called City on Our Knees. The book is about how Christians past and present have set aside differences, come together in unity, and stepped forward in action and prayer. He is the president of the record label Gotee Records. He created the label with Todd Collins and Joey Elwood in order to produce Out of Eden's Lovin' the Day after efforts to sign the group to an established label proved unsuccessful. "We all collectively said, 'Let's just give this a shot'", Elwood recalls; "Three naïve guys, a willing band, and some really good songs." Gotee features artists such as Relient K, House of Heroes, Jamie Grace, Capital Kings, and Abandon Kansas. However, as a recording artist, he is under contract with ForeFront Records. Toby has also helped establish a camp, called Camp Electric, located near Nashville, Tennessee, for young musicians who want to have pop and rock skills. McKeehan and his wife Amanda were married in 1994. Amanda, who comes from Jamaica, is the daughter of Judy and Robert Levy (of Jamaica Broilers fame). With his wife being Jamaican, and with regular visits to the island, he is well versed in Jamaican music and other aspects of local culture. They have five children: Truett (known as TruDog or Tru), born September 4, 1998; twins Moses and Marlee, adopted in 2002; Leo, born on November 2, 2004; and Judah, born March 24, 2006. Truett has appeared on the albums dc Talk's Solo EP, Momentum, Re:Mix Momentum, Welcome to Diverse City, Renovating Diverse City, Portable Sounds, Tonight, Christmas in Diverse City, Eye on It and Eye'm All Mixed Up as the artist "TruDog" while on This is not a Test he is credited as "TRU". Judah McKeehan has appeared on the albums Tonight and Eye on It with Truett. Truett is featured on the song "Backseat Driver" from This Is Not a Test, as well as on "Alone" from Hollyn's self-titled EP, as "TRU". His son Moses suffers from muscular dystrophy. His father died from dementia in 2015. ^ a b c d "TobyMac Discography, TobyMac Lyrics, Toby Mac, Toby MacKeehan". Jesusfreakhideout.com. October 22, 1964. Retrieved October 23, 2011. ^ Williams, Preston (May 15, 2008). "Giving Up Sports Has Never Sounded So Good". The Washington Post. Retrieved December 7, 2009. ^ EVANS PRICE, DEBORAH. "In The Driver's Seat". Billboard 124.32 (2012): 46. Music Index. Web. October 4, 2015. ^ Caulfield, Keith. "Toby Mac Brings Christian Music Back To No. 1." Billboard 124.32 (2012): 49. Music Index. Web. October 4, 2015. ^ "Christian Music, Christian Music Video, Christian Music News". Billboard. Retrieved September 6, 2012. ^ "Christian Music, Christian Music Video, Christian Music News". Hear It First. Archived from the original on July 11, 2011. Retrieved December 24, 2010. ^ "GRAMMY Award Results for TobyMac". National Academy of Recording Arts and Sciences. Retrieved January 10, 2017. ^ Richard O. Jones (January 23, 2009). "Francesca Battistelli brings theater perspective to Christian music". The Middletown Journal. Archived from the original on July 16, 2011. Retrieved February 19, 2009. ^ "The 51st Annual Grammy Awards Winners List". National Academy of Recording Arts and Sciences. Archived from the original on December 4, 2008. Retrieved February 19, 2009. ^ CAULFIELD, KEITH. "Josh Groban Gives 'All' With Third No. 1." Billboard 125.7 (2013): 55. Music Index. Web. October 4, 2015. ^ Price, Deborah Evans. "Higher Ground". Billboard 113.48 (2001): 19. Music Index. Web. October 4, 2015. ^ PRICE, DEBORAH EVANS. "Dove Nominations Recognize Diversity in Christian Music." Billboard 115.4 (2003): 18.Music Index. Web. October 4, 2015. ^ Deckard, Linda. "Premier Partners With First Co. Management For Festival Con Dios." Billboard 114.16 (2002): 22.Music Index. Web. October 4, 2015. ^ Price, Deborah Evans. "Right Time, Right 'Sounds'." Billboard 119.10 (2007): 43. Music Index. Web. October 4, 2015. ^ "December." Ccm (15247848) 29.6 (2006): 14. Music Index. Web. October 4, 2015. ^ "TobyMac \'honored\' that 5 of his albums have been certified Gold". Retrieved November 18, 2018. ^ "Toby the Mac – The Bottom Line, Ministries". tblfaithnews.com. Retrieved November 18, 2018. ^ Made, Relevant. "TobyMac". ccmclassic.com. Retrieved November 18, 2018. ^ "MMA at the Movies: A Comprehensive Guide". Bloody Elbow. Retrieved November 18, 2018. ^ Hatfield, Daemon (August 23, 2006). "DDR ULTRAMIX4 Partial Track List". IGN. Retrieved November 18, 2018. ^ "TobyMac on K-LOVE". K-LOVE. Retrieved November 18, 2018. ^ "News". Christianrock.net. Archived from the original on October 28, 2011. Retrieved October 23, 2011. ^ Mayfield, Geoff. "No Genre Immune From Year's Sluggish Start." Billboard 119.10 (2007): 47. Music Index. Web. October 4, 2015. ^ Price, Deborah Evans. "The Open Road." Billboard 120.18 (2008): 9. Music Index. Web. October 4, 2015. ^ 2007 Year End Charts/Top Christian CHR songs Archived May 25, 2009, at the Wayback Machine. R&R magazine. Retrieved January 6, 2008. ^ Price, Deborah Evans. "Portable Sounds." Billboard 119.11 (2007): 51. Music Index. Web. October 4, 2015. ^ "TobyMac" (PDF). trueartist.org. Retrieved November 18, 2018. ^ "Thrillville Off the Rails Soundtrack List". forums.frontier.co.uk. Retrieved November 18, 2018. ^ Price, Deborah Evans. "Mac World." Billboard 122.7 (2010): 22-24. Music Index. Web. October 4, 2015. ^ Caulfield, Keith (February 17, 2010). "Sade's 'Soldier' Sizzles at No. 1 on Billboard 200". Billboard. Retrieved September 7, 2012. ^ "TobyMac, "Moving Pictures DVD" Review". jesusfreakhideout.com. Retrieved June 4, 2018. ^ "Major League Baseball taps TobyMac's "Tonight" for "30 Clubs in 30 Days" series - Gospel Soundcheck". Gospel Soundcheck. March 10, 2010. Retrieved November 18, 2018. ^ "DC Talk's TobyMac Makes Opposites Attract on 'Hello Tonight' Tour". Billboard. Retrieved November 18, 2018. ^ "2010 Dove Award winners - Gospel Soundcheck". Gospel Soundcheck. April 22, 2010. Retrieved November 18, 2018. ^ "2011 Dove Award Winners Announced < Music News | CBN.com". www.cbn.com. Retrieved November 18, 2018. ^ "Hot Christian Songs - Year-End". Billboard. Retrieved November 18, 2018. ^ "Make a Difference Tour 2010 Website". Retrieved November 5, 2014. ^ "Multi-Platinum Selling Artist TobyMac Garners Seventh Solo GRAMMY Award Nomination for "Best Pop/Contemporary Gospel Album"". Fusemix.com. Retrieved October 23, 2011. ^ "Christmas in DiverseCity Now in Stores". TobyMac. October 6, 2011. Archived from the original on November 11, 2011. Retrieved October 23, 2011. ^ "TobyMac, "Dubbed & Freq'd: a remix project" Review". jesusfreakhideout.com. Retrieved November 18, 2018. ^ Jesusfreakhideout (May 22, 2012). "TobyMac's Brand-New Single, "Me Without You", Debuts with a Whopping 53 Adds". Jesusfreakhideout.com. Retrieved August 14, 2011. ^ Caulfield, Keith (September 5, 2012). "TobyMac Earns First No. 1 Christian Album on Billboard 200 Since 1997". Billboard. Retrieved September 7, 2012. ^ Johnson, Kevin C. (October 25, 2012). "TobyMac's 'Eye' looks straight to the top". St. Louis Post-Dispatch. ^ tobyMac ("WebGirl") (June 12, 2012). "New Single 'Me Without You' Now Available". tobymac.com. Archived from the original on August 6, 2012. Retrieved August 14, 2011. ^ "tobyMac Album and Song Chart History". Billboard. September 1, 2012. ^ "Blue Bloods – Men in Black (Preview)". CBS. Retrieved February 6, 2013. ^ Evans Price, Deborah. "Eye on It." Billboard 124.32 (2012): 44. Music Index. Web. October 4, 2015. ^ "TobyMac - Eye on It ACC Tournament Theme - Videos". ^ "I'm in Love with a Church Girl". IMDb. Retrieved February 14, 2012. ^ "Eye'M All Mixed Up". Last.fm. Retrieved November 5, 2014. ^ "iTunes Music - Beyond Me - Single by tobyMac". iTunes Store. ^ Jessen, Wade. "Crouch's Death Impacts Charts." Billboard 127.2 (2015): 80. Music Index. Web. October 4, 2015. ^ Jessen, Wade. "Battistelli Sets Airplay Record." Billboard 127.1 (2015): 72. Music Index. Web. October 4, 2015. ^ "TobyMac.com". TobyMac. April 27, 2015. Archived from the original on May 1, 2015. Retrieved April 28, 2015. ^ Price, Deborah Evans. "Toby Mac." Billboard 127.25 (2015): 66. Music Index. Web. October 4, 2015. ^ Asker, Jim. "Tobymac on Top." Billboard 127.25 (2015): 73. Music Index. Web. October 4, 2015. ^ "Here we go..." Facebook. June 6, 2015. Retrieved June 7, 2015. ^ "New song..." Facebook. July 8, 2015. Retrieved July 24, 2015. ^ "Brand new song..." Twitter. July 24, 2015. Retrieved July 24, 2015. ^ "Jesusfreakhideout.com: TobyMac, "Light Of Christmas" Review". jesusfreakhideout.com. Retrieved January 22, 2018. ^ "I Just Need U: TobyMac releases "I Just Need U" single". crossrhythms.co.uk. Retrieved June 29, 2018. ^ "tobyMac Chart History". Billboard. Retrieved November 17, 2018. ^ Niagara Frontier Publications (July 19, 2018). "TobyMac Drops New Track: Everything". Niagara Frontier Publications. Retrieved July 19, 2018. ^ "TobyMac Drops New Single "Scars"". thechristianbeat.org. Retrieved October 1, 2018. ^ D. C. Talk; The Voice of the Martyrs. Jesus Freaks: Stories of Those Who Stood for Jesus, the Ultimate Jesus Freaks: D. C. Talk and The Voice of the Martyrs: Books. ISBN 1577780728. ^ dc Talk. Jesus Freaks: Revolutionaries: Stories of Revolutionaries Who Changed Their World: Fearing God, Not Man (Jesus Freaks): dc Talk: Books. ISBN 0764200844. ^ Mac, Toby; Tait, Michael. Under God: Toby Mac, Michael Tait, Toby Mac: Books. ASIN B0009U7YQO. ^ Mac, Toby; Tait, Michael. Living Under God: Discovering Your Part in God's Plan: Baker Publishing Group, Michael Tait: Books. ISBN 0764201425. ^ Mac, Toby. "City on Our Knees at Amazon". Amazon.com. Retrieved October 23, 2011. ^ a b Geil, Mark (April 14, 2008). About Gotee Archived September 13, 2010, at the Wayback Machine. Originally posted on Christianitytoday.com. Retrieved July 12, 2010. ^ "Camp Electric Home". Campelectric.com. Retrieved October 23, 2011. ^ "Biography of Gospel Hip Hop Artist tobyMac". About.com. Retrieved August 23, 2009. ^ "Mind and Spirit – Chatting with a Christian ROCKER". Jamaica Gleaner. Retrieved August 23, 2009. ^ "Christian Rapper TobyMac Dishes on Staying Relevant at 50 -- and Why He's Inspired By Justin Timberlake". Retrieved October 17, 2017. ^ "TobyMac's Fulfillment Comes Through Servitude". CBN.com (beta). Retrieved October 17, 2017. Wikimedia Commons has media related to TobyMac.